In 1939, the Japanese Navy General Staff demanded a development of a project of a destroyer with a speed of 40 knots. The project was called "Project F52" and was included in the plan called Maru Yon. In connection with this, a project was prepared and the construction of the Japanese destroyer with number 125 (later named Shimakaze) began. Laying the keel took place on 8 August 1941, in the Maizuru Naval Arsenal. Launching was carried out on July 18, 1942. ​Kagero is a publisher based in Lublin, Poland. They do their books in both Polish and English. This book is all in English. ​This book is soft-cover of 20 pages in 8 1/4" x 11 3/4" page format. It comes in a clear self-sealing envelope. 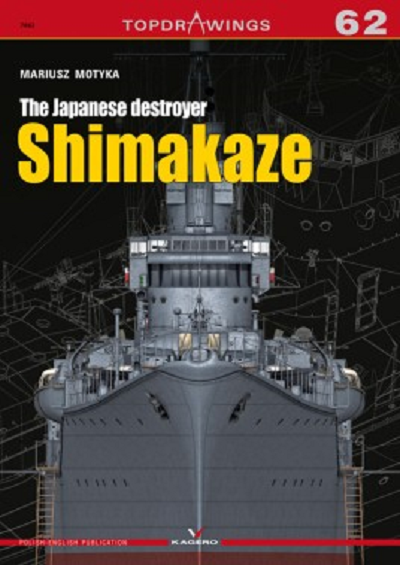 The cover art shows a color bow view of the Shimakaze, posed against a dark green background with a white line drawing of the top of the ship on it. Counting the back cover the book contains 81 walk-around type line drawings of every inch of the Shimakaze. There is a large sheet inserted in the book that is 27" x 18" format printed on both sides and folded twice to fit the book. The face side has a port, starboard and top view and a bulkhead line drawing illustration in 1/200th scale. The reverse side has 27 walk-around line drawings of various parts of the Shimakazi. This is one great set of drawings of the Shimzkaze. I cannot find mention of a possible model kit of it on the net. It will be of interest to naval historians though. I want to thank Casemate Publisher for this review sample and the folks at Kagero too.